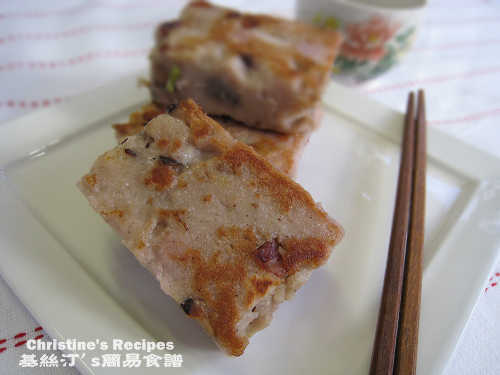 我search "粘米粉" in the serach box, it took me to this recipe. I was making this Taro cake today, it is still being steamed and hopefully they will turn out ok :) I actually have one question and one comment. My question is where do you put the 3 tablespoons of oil? Is it in step 1 when you stir fried the sausages, mushroom and dried shrimp? When I did it, I just put it in the flour mixture. I don't know whether this is correct or not. I was following the recipe when I was making it. But then the English one does not instruct when to add the salt, however, you Chinese version does. What I did was I added in the water when I cooked the taro. Thanks for your hard work. Please keep the recipes coming. Much appreciation! The oil is for stir frying the ingredients in step 1. I've found your website recently and cannot stop looking through all your recipes (both Chiniese and English). :) I've also made 香滑的椰汁馬豆糕 and 蘿蔔糕, both turned out great! Thank you so much for your wonderful recipes. 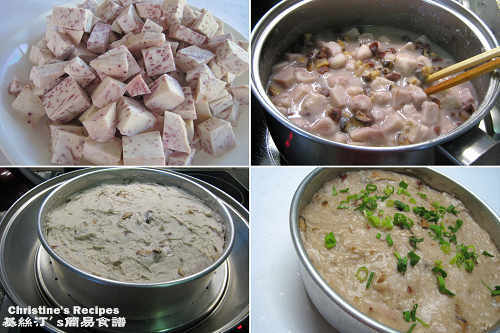 I was wondering if you have a recipe using taro to create a bird nest shape? I know it is shredded taro frying into a shape to hold seafood or other meat for presentation. I did not see it in your site, just wondering if you have a recipe of similar result. Thank you. Thanks for your love of my blogs. My daughters did not like them either. My friend gave me taro cake few years ago was very good. I ate it without pan fired. She put dried tunip and the taro is not mushy. She moved away our area, I cannot ask her about her recipe. Thanks for this great recipe, mine turned out great!